Durring the post reflexion it’s the idea that you bring everything together. 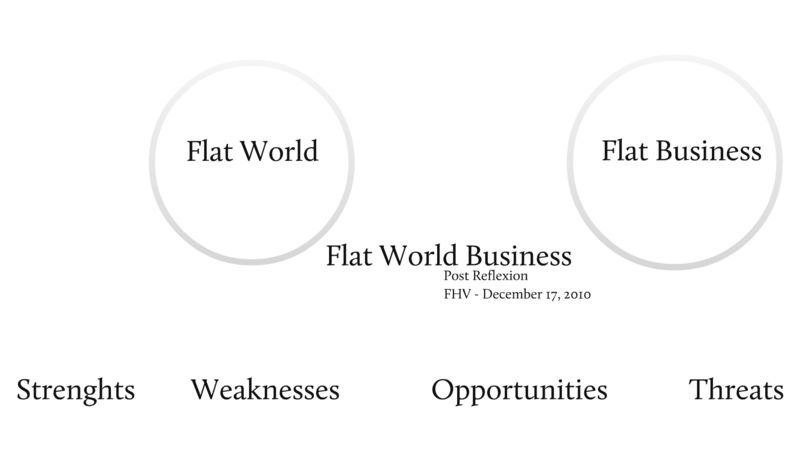 I’ve made a Prezi – Flat World Business which I will invite you to work on. You can add and share your ideas on the flat world, flat business and make a SWOT analyses. This round-up should reflect what this course is all about, and what you learned from it! Register at Prezi (it’s free! ), and start editing! I also want to take a look into the near future with you…on the “future” page you can see what the flat world will be about the next 10 years. It’s challaging, but it’s good to know that your flat business has eyes on the future! Please keep them there, since you’ll have to be on the each of this evolution to keep up and stand a chance with your flat business!